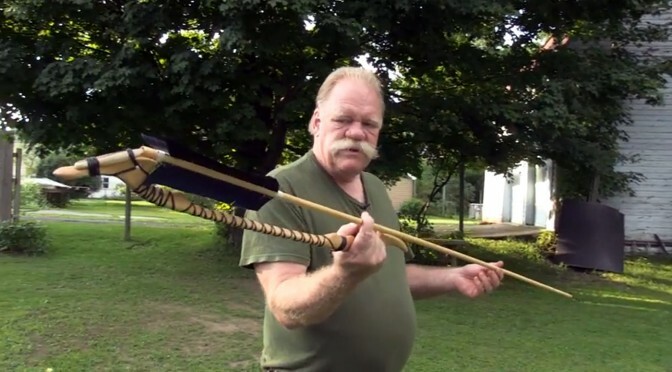 In this short video, Bob Berg shows why using an atlatl is an improvement over throwing spears with your bare hand. See the difference in speed and penetration! Love your website, You offer a lot of support and your prices are reasonable. It was a pleasure meeting you at Indian Rock in October 2015. I will probably purchase more darts in the future. I may try your kits after watching your video. This is fun! Hope you had a Merry Christmas and wishing you a Happy New Year. Tryed my atlatl for the first time yesterday and was amazed at how fare it traveled on the first throw. 76 yards. Awesome? Check You Tube for the video. If it isn’t there, we will locate it. We haven’t gone to Baltimore recently.